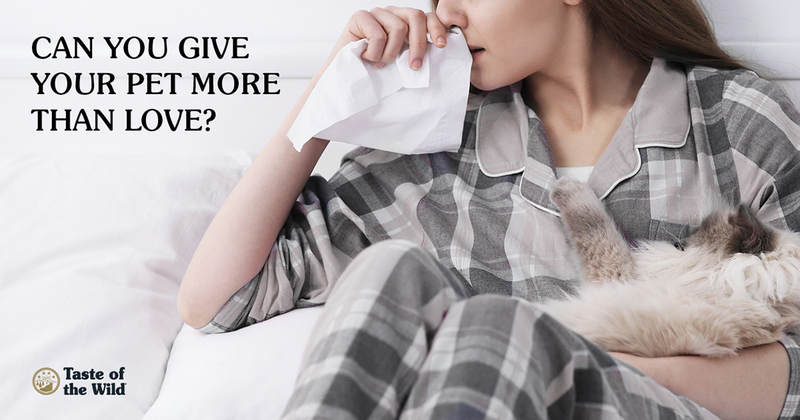 When you’re sick, your dog or cat is often the best medicine. The soothing purr of your cat or the warmth of your dog’s chin on your lap can help you rest and recuperate. But did you know you could make your pet sick? You may have heard the term “zoonosis,” referring to the spread of infectious agents from animals to humans. These include parasites such as hookworms and roundworms, fungi like ringworm, bacteria and even viruses such as rabies. But diseases can also leap the other way — from people to animals — in a process known as anthroponosis or reverse zoonosis. Even worse, some diseases can travel back and forth between owners and pets like a tennis ball in a game of fetch. Although instances of reverse zoonosis are relatively uncommon, they can pose a serious risk for cats and dogs, especially young or old pets with compromised immune systems. While little is currently known about reverse zoonosis, it is gaining interest in the medical community. Some viruses, for instance, may mutate and become more dangerous or more transmissible when they move from humans to animals. In 2009, the United States experienced an influenza pandemic caused by the H1N1 virus. Sometimes called the “swine flu,” the virus was initially thought to have jumped from pigs to people. As it turns out, it also leaped from people to other animals. In the first documented case, a woman was hospitalized with the H1N1 flu. While she was treated, her indoor cat died from pneumonia caused by the H1N1 virus. Since then, several more cats, a dog and a number of ferrets appear to have caught the virus from humans. In people, symptoms of the flu include a sore throat, runny nose, coughing, fatigue, fever and chills. Pets with the virus typically show similar respiratory signs, often lose their appetites and, in extreme cases, may die. Although there are only a handful of documented cases of the flu virus passing from people to animals, it’s possible that additional cases went unreported. To be safe, it’s a good idea to keep your cat out of your bed when you have the flu. And if your pet develops respiratory signs after you’ve had the flu, schedule an appointment with your veterinarian. Although methicillin-resistant Staphylococcus aureus, or MRSA bacteria, typically affect humans, they have been known to jump to animals. These bacteria are resistant to many antibiotics, so treatment options are limited. In some cases, MRSA infections can lead to death. These bacterial infections can also move from humans to animals and back to humans, so an owner and pet could potentially swap the infection back and forth. Both people and pets can be colonized with the bacteria, meaning they can host the MRSA on their skin or in their noses without actually becoming ill. MRSA can cause skin and wound infections and the bacteria can be transmitted from contact with the skin or contaminated objects such as bandages. A few years ago, a young Yorkshire terrier was brought to the University of Tennessee College of Veterinary Medicine for vomiting, loss of appetite and a persistent cough. When the dog eventually died, veterinarians were surprised to find it had the bacteria that caused tuberculosis, most likely transmitted from the owner, who was being treated for the disease. Cats can also catch tuberculosis from people, but it’s very rare. The best way to help prevent zoonotic or reverse zoonotic diseases is to practice good hygiene. That means scrubbing hands with soap and warm water for at least 15 seconds or using an alcohol-based hand sanitizer before and after handling pets. It’s best not to kiss your pet on the mouth or allow them to lick your skin or any open wounds. The same goes for food dishes: Don’t allow your pets to lick your plate clean and wash your pet’s food dishes often. Wear gloves when handling your pet’s stool or urine and dispose of pet waste in the yard and litter box as soon as possible. Finally, schedule regular veterinary exams and keep up with vaccinations and parasite control to help keep your pets — and your family — in good health. RELATED POST: Pet Kisses: Should You Exchange Smooches on Valentine’s Day?